One of the most important things that you can do when designing your playground is to provide safety surfacing. While proper safety surfacing will not prevent all injuries it will greatly reduce the likelihood of life-threatening head injuries. Even if you do not purchase the surfacing material from us, please provide it for the protection of your children. USA Play is a provider of the most widely used and we feel most effective safety surfacing options. Engineered wood fiber is an economical playground surfacing used on nearly 3/4 of all playgrounds in the U.S. because of its high impact absorbing qualities & firm, slip resistant surface. If properly installed it allows for wheelchairs and strollers to traverse across it. Less expensive products such as sand and pea gravel just aren’t accessible. How can you tell if you are getting a genuine engineered wood fiber (EWF) that will be within your budget, meet all current safety and accessibility standards and give you peace of mind? If so, what is it certified for? 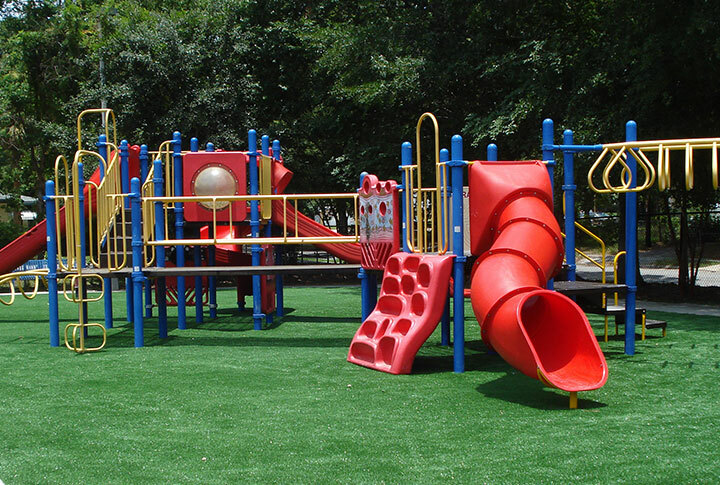 The International Playground Equipment Manufacturers Assoc (IPEMA) certifies EWF for impact attenuation (ASTM F1292), to be free of nails, staples and hazardous metals such as Lead, Mercury and Arsenic, and to be ground properly so that the product will knit together to meet federal accessibility laws (F2075 test method for EWF.) You can see if your EWF surfacing is certified by going to www.ipema.org. There is no 3rd party certification program for accessibility testing so ask your vendor for test results showing that their product has been tested for accessibility per ASTM F1951. Make sure the surfacing has been tested within the past 5 years. Does the manufacturer back up their surfacing products with any warranty programs? Let’s face it, we’re dealing with children here. What happens if they fall and get hurt? Who do you go to? Is there a specific way to install the surfacing so that it will be safe enough to protect the children yet firm enough to meet ADA guidelines? Wood carpet® by UsaPlay is certified by IPEMA per F1292 and F2075 standard test methods. In fact, our supplier has their own test equipment to perform testing on their surface in-the-field which means we can test our products in all sorts of conditions (hot or cold) to make sure they perform properly. It’s not required, but we want to make sure we consistently provide a top notch product at a competitive price. Woodcarpet® products by USAPlay are backed by a comprehensive warranty program with over 10 million dollars in liability insurance. We protect you our customers and give you peace of mind. When you purchase Woodcarpet® surfacing products by USAPlay we offer installation instructions to help you get the most out of your surfacing. Go to this link to read how to install and maintain your engineered wood fiber surface to meet current ADA guidelines. Engineered wood fiber is the most economic option that meets all the qualities and standards you need in a playground surfacing. You can get a quote us by email by clicking here or by calling 1-864-297-6410 to speak to a representative. Have email form have the address phone number space of the playground, depth preferred. We recommend 12 inches. 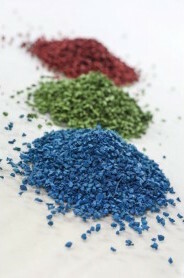 The other option of loose fill surfacing that we offer is rubber playground mulch. The truth of the matter is that the rubber playground mulch is made of recycled tires. The important difference is that the playground mulch has 99.9% of the metal removed while standard rubber mulch does not. It is a great option for a number of reasons. It can be very attractive because it comes in a variety of colors such as blue, green, rust, brown and others. The least expensive option is the uncolored or black which has not been colored. The coloring has a warranty of ten years. Another advantage is that the product does not breakdown and will be available to protect the child for up to 10 years. Many people ask about the safety of the rubber mulch versus the engineered wood fiber. That question was addressed by the EPA: “Playground surfaces can contain recovered rubber and PVC materials that are often more desirable than wood chips, sand, or asphalt, because they can provide more cushioning and thereby may be safer for children. You can find playground surfaces made with recovered materials at schools, military bases, and housing developments.” — Source EPA.gov. To get a quote for your playground just click here or call us at 864 297 6410. Pour N Play surfacing is a great option because it is low maintenance long lasting and looks great. There are really no limits to what you can create with the wide number of colors available. The other advantage is that there is less maintenance involved. , All that you have to do is blow off the leaves or debris with a hand blower. There is no need for raking or adding additional product in the future. For more information click here or call us at (864)297-6410. Artificial turf is another popular surfacing option. This is different from the turf used on sports fields because it is applied over a safety cushion that reduces injuries. It is also a popular option because of the beauty, low maintenance and long lasting qualities. For more information click here or call us at (864)297-6410.